Throughout his career as a lawyer and SEC Commissioner, Luis Aguilar advocated for equality. Now, he’s doing the same as a director on three boards. Luis Aguilar’s interest in law began when he was in grade school and he moved to Little Rock, Arkansas. The schools had recently desegregated, but social separation persisted, and Aguilar, a Cuban immigrant, was in the middle. As he witnessed the aftermath of desegregation, Aguilar was struck by the power of the legal process. “The thought of being a lawyer starts to creep up because you realize there’s this power out there that can force people to do things they don’t necessarily want to do volitionally—things I thought were good,” he says. Aguilar began law school with the intention of becoming a civil rights lawyer, but he soon shifted his focus to corporate and securities law. He began his career as an attorney at the US Securities and Exchange Commission (SEC), and for more two decades, he worked at both nationally recognized law firms and as general counsel, head of compliance, and executive vice president for a global asset management firm. His term as commissioner began on July 31, 2008, six weeks before the stock market crashed, and the agency entered one of its most active periods. “I was in the middle of the eye of the hurricane of what they call the Great Recession,” Aguilar says. “For better or for worse—and I hope for the better—my fingerprints are on the new generation of regulations that are going to govern the capital markets.” He then entered a brief retirement, but it soon became clear that sitting at home wasn’t satisfying for the self-described “type-A workaholic.” He became a partner at Alston & Bird before moving to McKenna Long & Aldridge. Shortly thereafter, he received a call on behalf of the majority leader of the US Senate asking if he would consider joining the SEC as a commissioner. 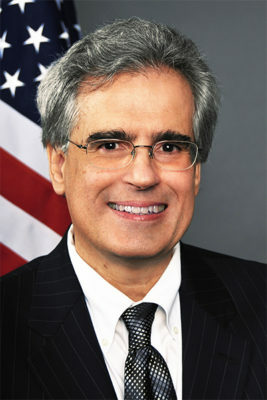 Originally appointed by President George W. Bush, Aguilar was reappointed by President Barack Obama in 2011, becoming the eighth longest-serving commissioner in history of the SEC and only one of three commissioners who were appointed by presidents of two different political parties. When he left the SEC at the end of 2015, Aguilar was approached by various companies about serving on their boards. In due course, he joined the boards of Envestnet Inc., a provider of portfolio, management, and reporting solutions to financial advisors and institutions; Donnelly Financial Solutions Inc., a financial communications and data services company; and MiMedx Group Inc., a regenerative medicine and biopharmaceutical company. In addition, Aguilar became a partner at Falcon Cyber Investments, an equity investment firm. If he represented the American people as a commissioner, then as a board member, Aguilar works with his fellow directors to oversee the overall direction and strategy of the company, with the goal of maximizing the company’s growth and, ideally, benefiting the shareholders, the employees, and the community at large. “In a way, a successful company lifts the boats for everybody,” he says. Aguilar has also been public about the importance of increasing diversity. As a commissioner, he often drew attention to the lack of women and minorities on boards, and in wealth management firms, C-suites, and the SEC itself. He has also advocated for the Rooney Rule, an NFL policy named after former Pittsburgh Steelers chairman Dan Rooney that requires teams to interview at least one minority candidate when hiring coaches.